Last week's menu was not followed very well because my husband was quite sick, so some things are being carried over for this week. 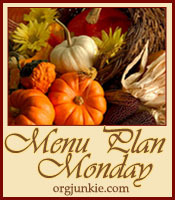 As always, be sure to check out Orgjunkie.com for more great menus! Hi Bethany, Hope your husband is better and you are able to stay healthy!